Kisses from Derby’s pasturemate, Remy. If you’re looking for an athletic dressage horse (or eventing prospect) you should check out my buddy Rems. He’s for sale. Well, as you’ve undoubtedly surmised, I’m taking a bit of downtime to help my knee recover. Interestingly, I was diagnosed with a tight (and angrily inflamed) iliotibial (IT) band. I say “interestingly” because if you’ve read a few of my posts, you know that I kvetch about tightness in my hips – and that’s where the IT band starts. The physical therapy is focused on loosening that band, improving its strength and flexibility, and the prescribed exercises concentrate on the hip. As I work through them, I can feel the entire band working, down to my knees, which is interesting. Needless to say, in addition resolving the pain, I’m interested in seeing the benefits that accrue from this work when I’m back in the saddle and really riding. Right now, when I do get on, I’m riding very defensively, protecting the knee. Which pretty much means hanging out in two point and getting off when it hurts too much. I’ve actually taken the last few days off, and have a call in to the doc to clarify exactly what I should/shouldn’t be doing during this time. In other news, I thought I’d take a second to write about my good buddy Remy. Remy is Christy’s fancy young horse. He’s also Derby’s pasture mate. Remy didn’t get the memo that he’s a horse. He thinks he’s a Golden Retriever, albeit a 17-hand one. I have never met such a friendly, goofy horse. Whenever I go to get Derby out of the field, I have to first receive welcome kisses from Remy. I don’t mind, he’s such a sweet and gentle fellow. The goodbye kisses, on the other hand, I am not looking forward to. Doe anyone else fall in love with their trainer’s sale horses? And no, don’t look at me. 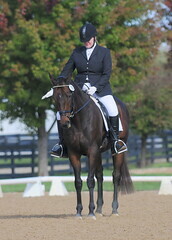 Remy is a big, fancy, athletic horse with powerful gaits that I am certain I could not ride. Personally, I am dreaming of the day that I see him at Rolex. He’s doing most of the dressage needed for a 4-star already. He also loves jumping and has a big, ground-eating stride that seems suited for long-format three-day events. Anyway, Rems is for sale. You can see fancy pictures and video of him over on his sale page. As nice as those are, though, I think I like the one of him kissing me best! Sarah Skerik is an experienced digital marketing executive and strategist with a long track record of success in content marketing, social media, demand generation, event marketing, sales enablement, product management and business development. I fall in love with most horses, can certainly relate to that. I hope you’re feeling much better soon and enjoying the downtime! I’d love to know about some of your exercises! It’s a very common problem among riders – and I suspect especially among dressage riders – as the amount you’re supposed to take movement in your hips instead of your back works and stretches muscles in a way any physical trainer would tell you is unhealthy. Think of off-horse stretching and how slow and steady it should be vs. stretching to your max in the tempo your horse moves. I’m definitely dealing with these issues right now, too! I hope you feel better quickly!